President Joko “Jokowi” Widodo on Saturday (1/12) at the Cigombong 1 toll gate, Bogor, West Java, inaugurated Ciawi-Sukabumi Toll Road Section I spanning from Ciawi to Cigombong. President Jokowi said that the construction of the Bogor-Ciawi-Sukabumi (Bocimi) toll road has been started in 1997, involving many investors. “In 2015 we negotiated to take over (the construction). The one-year negotiation was difficult and at the beginning of 2016 the construction and land acquisition began,” President Jokowi said. The President expressed hope that the Bogor-Ciawi-Sukabumi Toll Road will connect Sukabumi to Cianjur, then to Bandung, and finally to Cilacap. 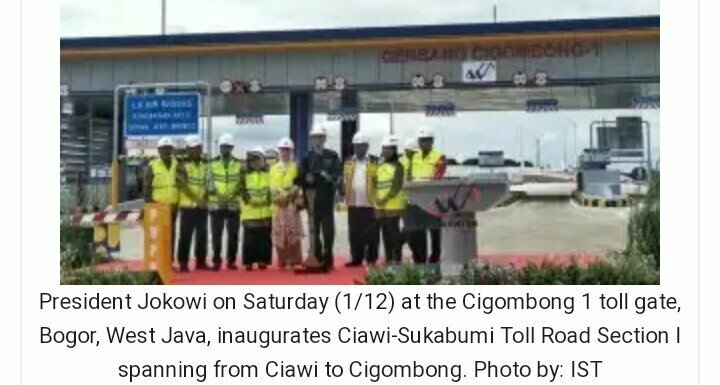 “Therefore, once again, this afternoon I am very happy to be able to inaugurate the Ciawi – Sukabumi Toll Road for Section 1 Ciawi – Cigombong,” President Jokowi added. He went on to say that the toll road will shorten travel time from Bogor to Sukabumi, increase mobility of people and goods, and reduce the transportation tariff. “We hope that the toll road can boost economic development in Sukabumi, including the tourism sector,” President Jokowi concluded. Ciawi-Sukabumi Toll Road has a total length of 54 kilometers, divided into four sections: Section I (Ciawi-Cigombong, 15.3 km), Section II (Cigombong-Cibadak, 11.9 km), Section III (Cibadak-West Sukabumi, 13.7 km), and Section IV (West Sukabumi –East Sukabumi, 13 km).